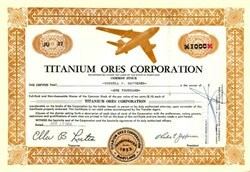 Beautifully printed certificate from the Titanium Ores Corporation issued in 1954. This historic document and has an ornate border around it with a vignette of an early U.S. Air Force Jet Plane. This item has the printed signatures of the Company’s President ( Charles E. Jefferson ) and Secretary ( Ellen B. Lutis ). This item is over 58 years old. Titanium was discovered by the Reverend William Gregor in 1790, a clergyman and amateur geologist in Cornwall, England. However, it was not purified until 1910, and was not refined and produced in commercial quantities until the early 1950s. Since then, titanium production has grown by about 8% per year, and since the early 1960s its use has shifted significantly from military applications to commercial ventures. Titanium is valued for its blend of high strength, low weight and excellent durability with excellent corrosion resistance. Following World War II, military usage, and particularly the Korean War, were the key drivers behind titanium production into military aircraft applications. By the middle of the 1950's, increasing amounts of titanium were becoming available in the civilian sector and applications began to emerge that capitalized less on titanium’s strength and light weight and more on its outstanding corrosion resistance. In the early 1980's, the commercial aerospace market briefly surpassed the military aerospace market for use of Titanium. 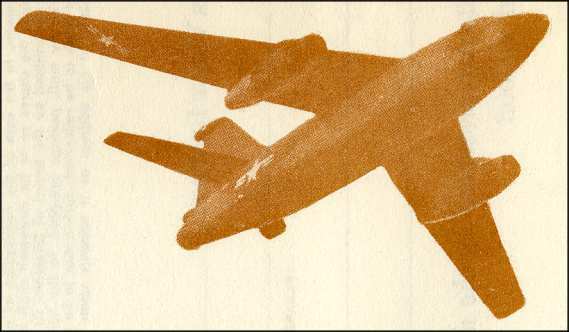 That trend was reversed by projects like the B-1 Bomber which used over 200,000 pounds of titanium for each plane.